Announcements here may be of interest to our members. E-mail your ad to Web Editor (webedit srp org uk) . Please include as much information as possible, and contact details. P hoenix Recorder Orchestra have released their new CD, Phase One, with Alison Wray, soprano, conducted by Pam Smith. The CD features Steve Marshall’s 7th Symphony, in which Alison sings words from poems by Judith Railton. 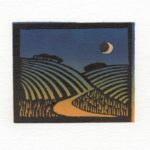 Each movement refers to a different aspect of the moon. Alison also joins the orchestra for Andrew Melville’s Brightness Falls, Barber’s Agnus Dei and in five spirituals. The orchestra have recorded some of their favourite pieces – Rosemary Robinson’s Sulgrave Suite, Steve Marshall’s Celtic Cluster and the English Folk Song Suite of Vaughan Williams. CDs are £10 (plus £2 postage). Further information (including two bonus tracks) is on the Phoenix website. Copies are available from the May Hill Edition website, from orchestra members, or email info phoenixrecorderorchestra org uk (info phoenixrecorderorchestra org uk) to order. Music by Turlough O’Carolan, Cornelius Lyons and early Irish songs. Performed on period instruments. Price: £12.00 plus pp (£1.50 up to two discs). Cantiones Renovatae early music group (Richard Lindsay, Stewart McCoy, Margaret Westlake and Kathleen Berg) called Paston Present. Music by Byrd, Taverner, van Wilder. Emma Murphy’s disc, “A Celtic Celebration” with Susanna Pell (viols) and Steven Devine (harpsichord), is available at the very special Christmas price of £11 POST FREE in UK from the Devine Music Website –www.devinemusic.co.uk. Featuring music from Playford, by Oswald, Solomon Eccles, Tollett, Carolan and many others, its crossover of folk and classical music has been highly acclaimed by the critics. An ideal Christmas Present for anyone who enjoys the recorder and/or anyone who loves the Irish/Scottish folk idiom! CD of Renaissance European Music. It includes music by Byrd, Lupo, Josquin, Sweelinck, Juan del Encino, and others. It can be ordered from Flauti Animati Scotica, or direct from the Scottish Music Centre. The price (in the UK) is £11 incl. p&p. A lovely present for you and your recorder playing friends. 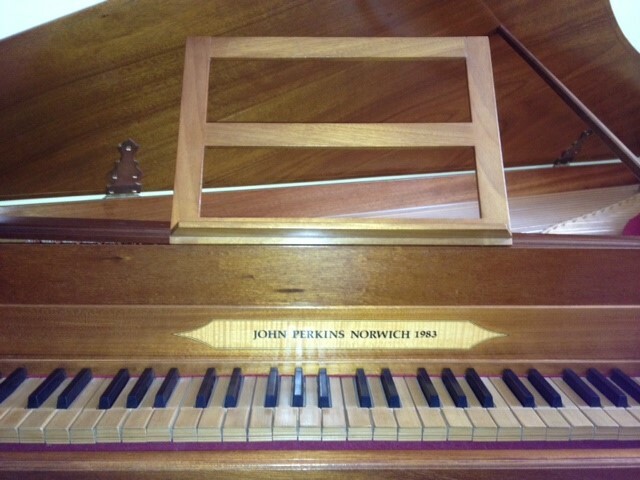 This spinet was made by John Perkins of Norwich in 1983 as a copy of an original by Baker Harris of London in 1760. 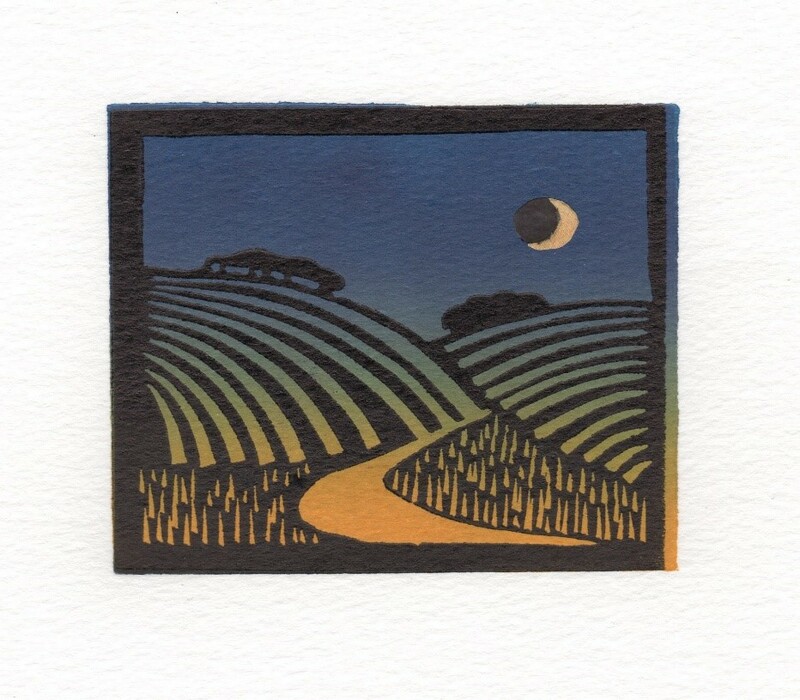 The original is now in the Russell Collection of Edinburgh University. This 5 octave instrument is at Baroque pitch (A=415). The body is made of walnut, the soundboard is spruce and the keys ebony and lemon wood. The bass strings are yellow brass and the treble phosphor bronze. 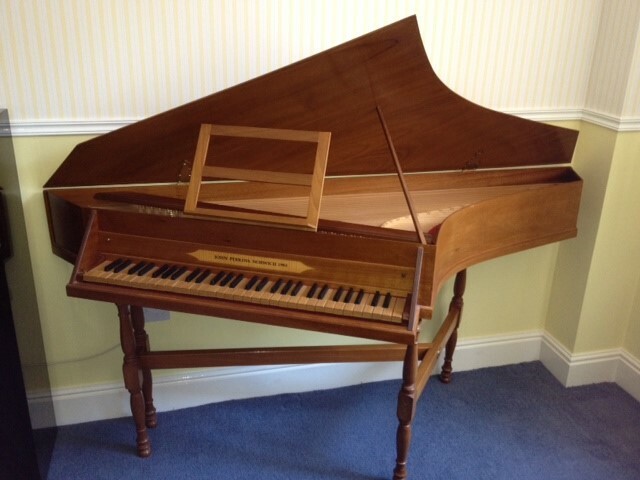 The spinet is in good condition and has been tuned regularly. It was serviced in 2013, which included replacing some plectra and re-voicing. There is a minor crack on the soundboard at the top end, but it does not produce any buzzing and I have been advised that it does not need attention. 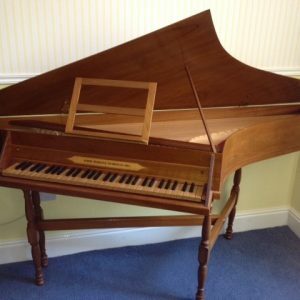 The dimensions of the spinet are 178x65cm. The trestle stand is 63cm high. Included are a music stand, lid post, tuning peg and spare strings. The instrument is easily portable. I attach two photos. The asking price is OIRO £3,000. Contact: Jane Bevan jane_bevan btinternet com. 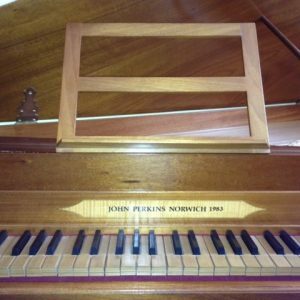 I have a large collection of music for sale, some of which comes from the collection of Ron Skins, director of Norfolk SRP for 50 years. Not all of it is recorder music but a large proportion is either written for recorder or suitable for various consort arrangements. A spreadsheet of the music for sale is available here. I am looking to sell for a nominal price per copy plus P&P, with any proceeds going to a music therapy charity. Please email me at flautodolce corystes plus com if you are interested or want further details. N ew design, easy-carry. The smallest (most fragile) dowels are stored in the base.